AMSOIL Quickshot® (AQS) is a premium fuel additive formulated to thoroughly clean and restore peak performance in small engine and powersports equipment fuel systems. It also stabilizes fuel between uses and during short-term storage periods. Its revolutionary technology focuses on three major fuel-related issues plaguing small engines and powersports equipment: ethanol, water and dirty pump gas. into the engine, it creates a lean burn situation that increases combustion chamber temperatures and can lead to engine damage. 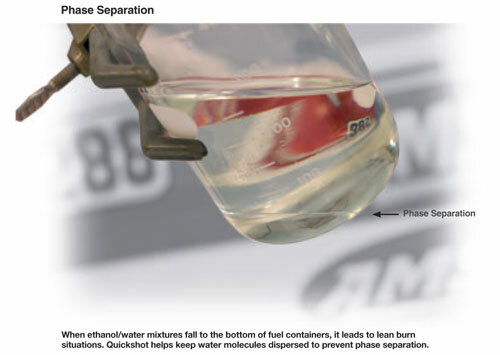 AMSOIL Quickshot is designed to keep water dispersed throughout the tank, moving it out as a normal part of operation and decreasing the chance of ethanol separating from the gasoline. Water finds its way into gas tanks through condensation in tanks open to the atmosphere, gas pumps and other environmental conditions, and if left untreated, will cause a myriad of starting, performance and corrosion problems. By keeping water dispersed in tiny molecules and safely moving it out of the tank through the combustion chamber, Quickshot helps maintain engine performance and protects against damaging corrosion. Dirty gasoline causes fuel system gumming and varnish, as well as piston and combustion chamber deposits. Although all gasoline sold in the U.S. is formulated with a lowest additive concentration (LAC) level of detergent additives, these detergent levels are not enough to prevent deposits from building up on critical fuel system components. Quickshot contains unique chemistry that quickly detaches and carries away deposits and buildups in fuel systems, injectors and carburetors, while also cleaning hard-to-remove deposits on piston tops, spark plugs and other combustion chamber parts. Quickshot is recommended for use in all two- and four-stroke gasoline-powered engines, including motorcycles, snowmobiles, boats, personal watercraft, ATVs, edgers, tillers, mowers, snowblowers, chainsaws, generators and farm and construction equipment. However, AMSOIL P.i. Performance Improver is the superior choice for passenger vehicle applications. Quickshot is designed for an initial clean-up dose of 8 oz. per 6 gallons of gasoline, followed by 8 oz. per 12 gallons thereafter.